There was quite a bit of REST chatter at Øredev last week. I sat in on the REST in Practice tutorial by Ian Robinson and Jim Webber (if you have not read the book they co-authored, then do – it’s really well written). There were a couple of things that these two guys cleared up for me, in the tutorial and in conversation during the week. Application state is in the head of the consumer, not the provider of the resources. This suggests that we should be able to recompute the state of application at any time. If we can recompute the application state, then we don’t need to explicitly implement the entire application state machine in the provider, nor the client. You may start off with modeling an application state machine on paper and discover the life cycle of resources. Implementing this is then simpler because we are only need to implement the lifecycle of the resource, not the entire application state. The way the consumer drives the state machine is just be reacting to available transitions in the representation of a resource. Now you give the provider the freedom to change the application state machine and the consumer will react to the new state machine by discovery. That is significant. Use hypermedia to refer to yourself. This came up in the tutorial because I objected to a resource including a hypermedia link to itself, regardless of its state. To me, it seemed to have little value because you already have the representation of a resource in a particular state, so why include hypermedia for itself. For example, this is what a resource will look like without a link to self. If we include a link to self, then the representation looks like this. Look Ma! I don’t have to expose a URI template anymore. It’s all discoverable. That is significant. REST support in WCF is heading in the right direction. I also listened to Glenn Block’s talk on his team’s work on HTTP and REST support in WCF. It’s still early days but I think they are paying attention to experts in this space and giving priority to the developers that will use it. What Glenn showed was a method signature that resembled the HTTP operation on the resource. Sure, it’s using a lot of convention over configuration to get rid of the attributes. Now that may not seem like a big deal, but I do think that it is moving the HTTP abstraction down to a level that is more resource friendly. When you are building a RESTful architecture, then you do think quite naturally in terms of the resources and their allowable HTTP operations for obtaining state or triggering a state transition. By moving away from mapping HTTP operations to a service contract, it introduces the necessary mental shift from RPC to Resources. And that is significant. What’s worse than BIG DUF? A BIG DIC! Most agile people say big designs up front rarely pay off. You spend so much time doing design that you delay the opportunity of feedback from real, working software. But I sometimes do BIG DUF. It’s not that the design is big, it’s the problem that is big. So I need an up front big picture with just a few big parts. It helps me conquer and divide. That’s not a bad thing. What I find really painful is casting the design in concrete. When your design is cast, then your mental state is already cast in concrete too. And that means that it is a lot harder to do the right things. So, more gets added to the concrete slab and it’s real hard work to break anything off. When I have a BIG DUF, I often look at how to reduce it, rather than increase it. I don’t think it’s wrong to have a BIGDUF, it’s worse if you have a BIGDIC (BIG Design in Concrete). That concrete block will hurt you later … a lot. If you hate reading lengthy blog posts and dig the mind map view of the world, then add Steve van der Merwe’s blog to your feed gadget. 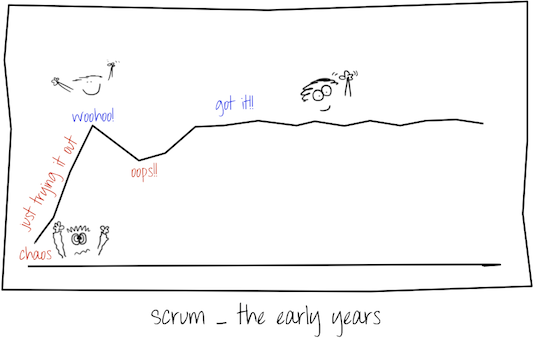 What I really like is his short quick observations and great views about software development. But for me, it’s even better that I get to speak to him regularly, in person. If you’re in the Cape Town area, make a point of finding him and chatting to him. He makes ubuntu real.